Time for one of our infrequent updates from the (new!) 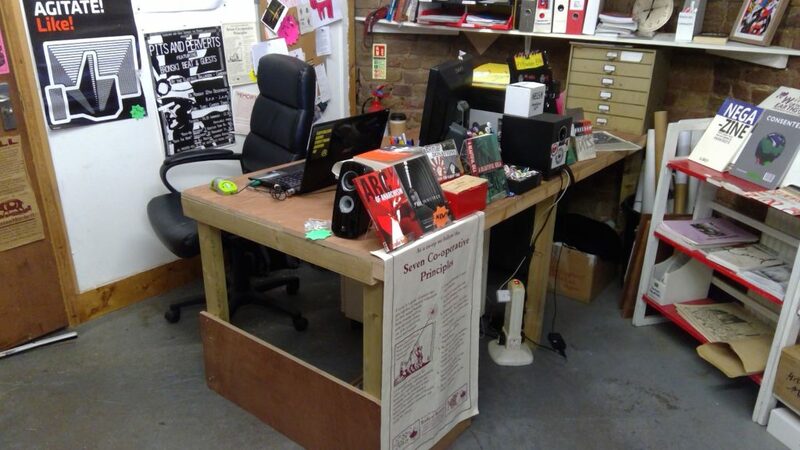 desk at Angel Alley, so strap in and gird those loins for a taste of the fabled anarchist work ethic. The bookshop has hosted a multitude of events this month, in particular a successful fundraising quiz for Queer Care compered by one of our bookshop co-ordinators which raised a handy £50, and a solidarity film night and talk for Russian anti-fascists earlier this week. Our next public event is a free screening, Death of Stalin, which takes place on Sunday. More generally, arguments with the local KFC joint over their tendency to fill the alley with rubbish aside, we’ve had a reasonably good few weeks. Long-time customers will know that for years we have been running our entire establishment off a tiny desk, which was like trying to fit Andre the Giant into a Mini. No more! Our kind friends at Dog Section Press have put together a much larger affair (see pic), so “from the desk at Angel Alley” no longer has be typed on a laptop precariously balanced between the knees. Alongside our sudden luxurious table space, we’ve had yet more new stock arrive (including Zapatista coffee for the first time in a while – and even new mugs to put it in) which we obviously highly recommend a browse of next time you’re in Tower Hamlets, but the real standout of the month has been a surprisingly quick turnover of free papers getting distributed out of the building. In particular, having run out of our own Winter 2018/19 edition there has also been a flurry of handouts of Rebel City 10 (now all but gone) and Dope has run short. This has been thanks to a combination of distros by local anarchists round Brick Lane and some truly virtuoso selling by local rough sleepers who have come in for Dope’s free distro scheme, run out of those, picked up our remaining Freedoms, cleared them as well, and finally started going through the Rebel Cities. We’ll have some Dopes in again soon, but meanwhile are happy to be stocking new books and magazines including a beautiful issue 91 of Organise from the Anarchist Federation, Animal Squat from Dog Section Press, World’s End from Corporate Watch and a whole bunch of new offerings from the likes of AK Press and the established publishing houses. 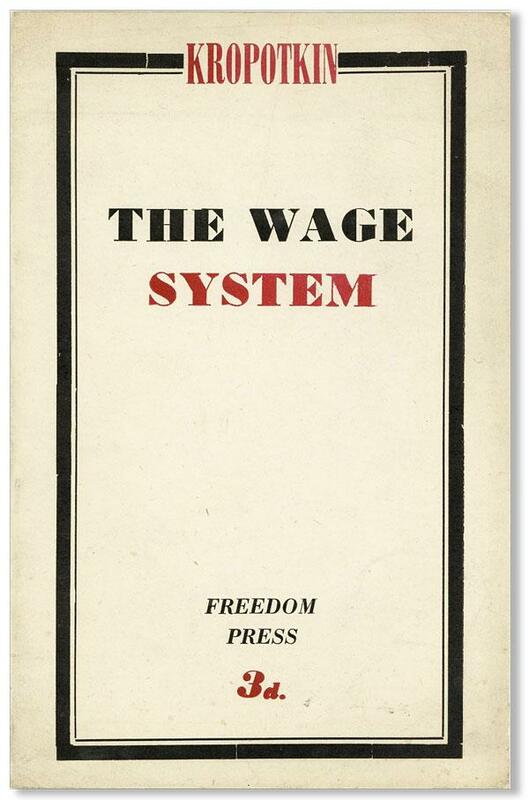 Highly active in the 1910s particularly, Barrett was a key organiser for the anarchist movement during the Great Unrest, which saw a significant syndicalist influence, and widely considered to be one of its best speakers and clearest writers. 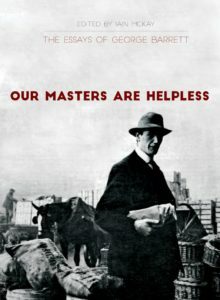 Edited by Anarchist FAQ lead author Iain McKay, Our Masters are Helpless puts together Barrett’s best pamphlets and articles, mostly written for Freedom Newspaper, highlighting his intelligent, accessible approach to anarchist theory and practice in the face of the mounting inevitability of war. 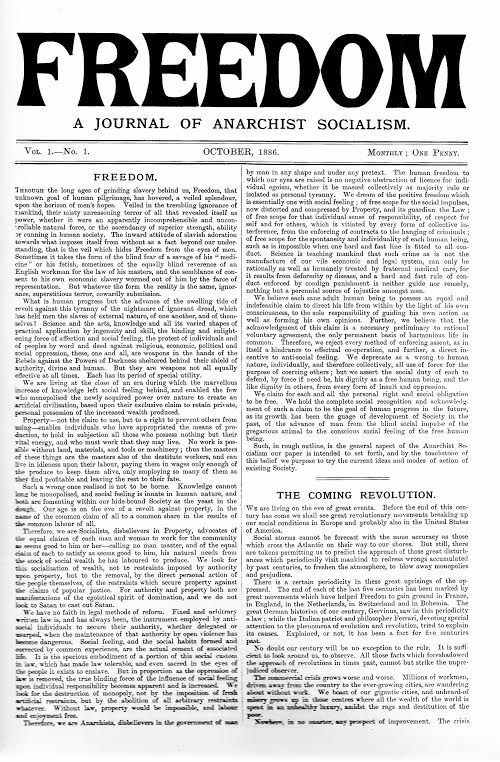 More has been done on expanding the digital sets of Freedom Newspaper in March, with our old sub-editor finding a large number of more recent 2000s papers PDFs which we thought had been lost. On top of that, the entire 1927-32 and 1947 sets have been painstakingly bundled and uploaded, meaning we’re getting ever closer to having at least one issue per year represented from 1936 onwards. Excitingly we’re also close, between digital and physical copies, to being able to provide access to the vast majority of Freedoms which have been produced since 1900. 1886-1927: All (NB// The original set of the paper finishes in 1927, Tom Keel continued the Freedom Journal until 1932, George Cores’ parallel ‘New Series’ ran a bit later, but otherwise there was a pause in production until 1936 when Spain and The World began).